This incredible grease trap interceptor does a phenomenal job removing isolating fat, oil and grease from wastewater, as it leaves your sink. 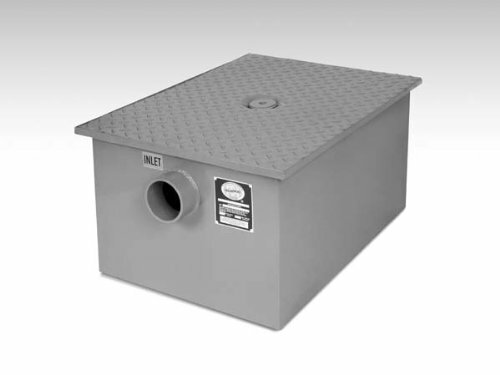 With removable baffles for easy maintenance it really is the perfect restaurant grease trap. * It's made of carbon steel with a non-skid deck plate and a suspended body to prevent a corrosive environment. It's no wonder the Plumbing & Drainage Institute recognizes its performance with their esteemed certification. * Specs - See the photo chart for dimensions and capacity. Constructed of 11 gauge Carbon Steel with corrosion resistant coating. Removable baffles for ease of maintenance. Main body is suspended to avoid creating a corrosive environment. Removes and isolates fat, oil, and grease.